Last April 2017, I got the chance to have a partnership with MyTaiwanTour. The third time in Taiwan made me feel so excited as it gave me the opportunity to see the cherry blossoms. The tour started picking up the guests from their accommodation or the nearest train station. It requires a minimum of 4 people. Actually, I’ve been to Taiwan four times already. If you’re interested how I keep on coming back to Taiwan in just few months, I was granted a multiple-entry visa. What I got excited about this Jiufen and Pingxi Day Tour is that I’ve never been to Pingxi for the sky lantern so I took this opportunity to tour northern of Taiwan. By the way, our transportation was really convenient. Our local tour guide speaks in Mandarin so he could not speak English but we had our interpreter from MyTaiwanTour. Listening to the history of Jinguashi was really interesting. Tons of gold were brought to Japan by cargo shipping. The ship with loads of gold sunk between Taiwan and Japan. Divers could not even find the gold in the middle of the sea. Our local guide is an experienced miner and he is 80 years old. It was my first time to see gold in its raw form. I was joking around to hide somewhere in my body. Our tour guide, Ting, is very knowledgeable and entertaining as well. We also talked about dried mangoes as Philippine’s dried mangoes are really famous in Taiwan. The Golden Waterfall is near the Gold Ecological Park in Jinguashi. The river bed has its golden color because of the heavy metal elements being deposited with the combination of the rainfall in the mining area. The place is very nice until a Taiwanese couple ruined the view. The bitterness in me wanted to push them on the cliff. No, I am just kidding. I just realized that this hidden spot is really nice to take photos of couples. This is my second time to Jiufen as I was here last year for my birthday of November but visiting again was worth it. I just realized that it was hotter as my first visit was really cold. Since Jiufen Old Street is famous because of Spirited Away from Studio Ghibli, expect a lot of people visiting the place. The first time I was here, I told myself I wanted to return and it happened. At Shifen Old Street, we had the chance to create our own sky lantern. We wrote our wishes using a Chinese bamboo brush. I was just people watching while the train passed by. Of course, I won’t forget to buy my favorite bubble milk tea. Anyway, I haven’t been to the Shifen Waterfalls but I suggest that you should go there. After the whole day trip, we were back to our respective accommodation. It was a tiring activity from hiking and getting around. Make sure to wear a comfortable pair of shoes. 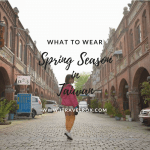 Because I love Taiwan so much that I decided to return for my fourth time. 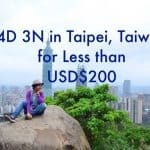 Check out the article: How I Survived Budget Travel 26 Days Taiwan with PHP 8,000 Pocket Money? This entry was posted in Blog, Travel, Travel Guide and tagged Jiufen, My Taiwan Tour, MyTaiwanTour, Pingxi, Taiwan. Bookmark the permalink. ← Surfing Siargao Island, Surigao del Norte for 6 Days – I made it!